EXTREMELY FINE GEM. THIS IS EASILY ONE OF THE FINEST ORIGINAL-GUM EXAMPLES OF THE ONE-CENT 1861 RE-ISSUE IN EXISTENCE. IT IS GRADED SUPERB 98 BY P.S.E., WHICH IS THE HIGHEST GRADE AWARDED. 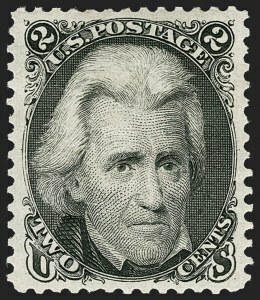 The 1c Re-Issue was printed from a new plate of 100 subjects, compared to the original plate of 200 in two panes. 10,000 stamps were printed (100 impressions). 3,195 of the 1c were sold, by far the largest quantity of any denomination of the set. However, almost none would grade as highly as the example offered here, which is lightly hinged and with wide balanced margins all around. The remaining 6,805 were destroyed on July 16, 1884. Ex "Hanover". With 2009 and 2016 P.S.E. certificates (OGph, Superb 98; SMQ $5,750.00). This is the highest grade awarded and only three others share it. EXTREMELY FINE USED EXAMPLE OF THE ONE-CENT 1861 RE-ISSUE. The 1c Re-Issue was printed from a new plate of 100 subjects, compared to the original plate of 200 in two panes. 10,000 stamps were printed (100 impressions). 3,195 of the 1c were sold, by far the largest quantity of any denomination of the set. The remaining 6,805 were destroyed on July 16, 1884. EXTREMELY FINE GEM. A SUPERB ORIGINAL-GUM EXAMPLE OF THE 2-CENT BLACK JACK RE-ISSUE, GRADED XF-SUPERB 95 BY P.S.E. THIS IS THE HIGHEST GRADE AWARDED. EXTREMELY FINE. AN OUTSTANDING USED EXAMPLE OF THE 2-CENT BLACK JACK RE-ISSUE, GRADED XF 90 BY P.S.E., WHICH IS THE HIGHEST GRADE AWARDED. ONLY 26 USED EXAMPLES ARE CONTAINED IN OUR CENSUS AND THE EXAMPLE OFFERED HERE IS UNQUESTIONABLY ONE OF THE FINEST. 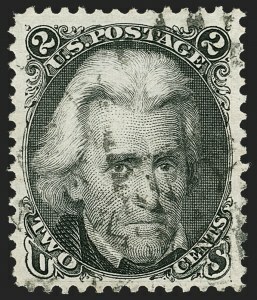 The 2c Re-Issue was printed from a new plate of 100 subjects, compared to the original plate of 200 in two panes. 10,000 stamps were printed (100 impressions). Only 979 of the 2c were sold; the remaining 9,021 were destroyed on July 16, 1884. The 2c plate can be easily identified by a spot on the cheek. Our census of Scott 103 used, available at our website at https://siegelauctions.com/census/us/scott/103 , records 26 examples. It is known with a variety of cancels. However, of these only five or six have centering we would consider Very Fine, and perhaps a couple others could be considered Extremely Fine. Several of the possibly sound examples have not been examined in decades and may in fact not be sound. 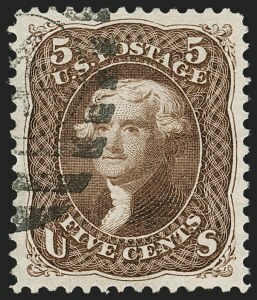 The example offered here, with wide balanced margins and a relatively light cancel, is a true condition rarity and clearly among the very finest examples known. Census No. 103-CAN-22. Ex Merlin. With 2005 P.F. and 2011 P.S.E. certificates (XF 90; SMQ $50,000.00). This is the highest grade awarded and only two others shares this grade. VERY FINE. 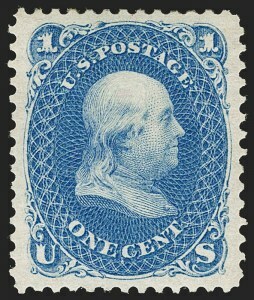 AN EXCEEDINGLY RARE USED EXAMPLE OF THE 3-CENT 1861 RE-ISSUE. ONLY 20 USED EXAMPLES ARE RECORDED IN OUR CENSUS. The 3c Re-Issue was printed from one of the original plates, which contained 200 subjects in two panes. 10,000 were printed (50 impressions). Only 465 of the 3c were sold; the remaining 9,535 were destroyed on July 16, 1884. 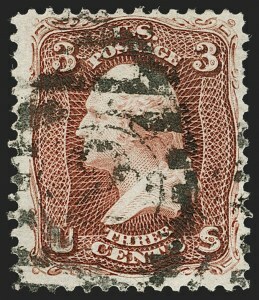 Our census of Scott 104 used, available at our website at https://siegelauctions.com/census/us/scott/104 , records 24 examples, plus one with a non-contemporary cancel (not shown). Only seven are confirmed as sound, and several of those are off-center. Census No. 104-CAN-19. With 2011 P.S.E. certificate. EXTREMELY FINE. A STUNNING USED EXAMPLE OF THE 5-CENT 1861 RE-ISSUE. ONLY 38 USED EXAMPLES ARE RECORDED IN OUR CENSUS, AND THIS IS EASILY ONE OF THE FINEST. 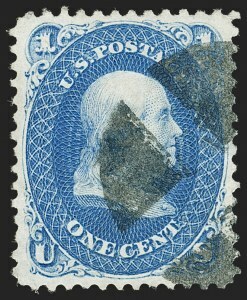 The 5c Re-Issue was printed from a new plate of 100 subjects, compared to the original plate of 200 in two panes. The Re-Issue plate can be identified by a notch at bottom. 10,000 stamps were printed (100 impressions). Only 672 of the 5c were sold; the remaining 9,328 were destroyed on July 16, 1884. Our census of Scott 105 used, available at our website at https://siegelauctions.com/census/us/scott/105 , records only 38 examples. Census No. 105-CAN-01.